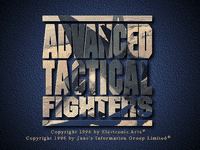 ATF was the first game made by Jane's Combat Simulations (part of EA). What set this sumalator apart was the reference to Jane's (THE worldwide authority on modern weaponry information) and an extensive ingame database containing detailed information about all of the game's aircraft, weapons, vehicles, ships, etc. The game features 2 full campaigns, lots of single missions, an in-game mission creator, and a quick mission creator. There's also Duosoft's toolkit, to modify the game with custom add-on libraries. The game main focus is on futuristic aircraft and campaigns. Many of the flyable aircraft were still in development at the time of the game's release. Flyable aircraft include the B-2 Spirit, Dassault Rafale, F-117 Nighthawk, F-14 Tomcat, F-22 Raptor, F/A-18 Hornet, Grumman X-29, X31 and Harrier Jump Jet.